Someone's about to get their just desserts. Riley Spencer is officially the new owner of the Cinnamon Sugar Bakery in the small town of Danger Cove. She's excited about the grand re-opening, but when she learns a hoax letter went out to the residents of Danger Cove informing them of free baked goods, she panics and does the only thing she can - quickly sets out plates of muffins, cupcakes, and cookie bars. Crisis seems to be averted...until the body of local recluse Nathan Dearborn is found in the bakery bathroom. The cause of death: peanut allergy. Riley's certain not a single item made with nuts left her kitchen, but no one believes her, least of all the police. To save her bakery and her reputation, Riley is determined to figure out who brought in the fatal pastry. With support from her best friend, Tara, and her long-time crush, Jared, Riley discovers secrets from Nathan's past that make her question if his death was truly an accident or something more sinister. With suspects galore, the police breathing down her neck, a love life in turmoil, and a bonanza of baked goods, Riley has her work cut out for her catching a killer...before he strikes again! I really enjoyed this story. A young girl, an orphan, takes over ownership of her grandmothers bakery. Soon after a strange email a dead body turns up in the bakery on the day of its grand reopening no less. The characters were likable and the main character was funny. It was a light cozy mystery and I look forward to the next in the series. The narrator was good, her voice was perfect for the character, on occasion I found it a little difficult to follow who was talking as her voice for the characters were similar. It wasn't overly distracting though and most of the time I followed ok. I would certainly listen to her again. I received a free review copy of this book at my request in exchange for an honest review. I enjoyed the book...I wish I had read the previous books. Riley takes over her grandma's bakery. She is seeing Will and thinks life is good. In walks Jared who sends her body tingling (unlike Will), in walks Tara - intent on making trouble &amp; to top things off she finds a dead body in her bakery! He has died from a nut allergy but Riley's bakery is a 100% nut free establishment so to her...this spells murder and she is determined to figure out what happened. This takes the friends &amp; family into a spiral of who done its and how the dead body ties in with Riley's life. It had me guessing right until the very end. What did you love best about Death by Scones? The main character is funny and loveable. The story is well-written. The ending is foreshadowed but a bit of a surprise. It is a good ending. This book is suspenseful but fun. I liked all the characters. There was very good character development in this book. Grandma is awesome, and so are the two boyfriends. Have you listened to any of Melissa Meshey’s other performances before? How does this one compare? I am new to this narrator. She is very good and perfect for this book. It made me laugh repeatedly. The concept of the book is great. I received this book for free from the author, narrator, or producer in exchange for an honest review. Relatively clean book. The story was interesting and kept me engaged and trying to figure out who committed the murder. There is a bit of romance to spice things up. I was definitely caught by surprise at the person responsible for all the craziness. I did not see it coming! The narration was good and brought the story to life. The characters were well developed and the story progressed at a good pace. I felt really bad for Riley. Her first day as owner of Cinnamon Bakery and everything goes wrong. And when she thinks things could not get any worse, they do! The book kept me on my toes and quite entertained. I'm looking forward to more stories from this delightful series. What made the experience of listening to Death by Scones the most enjoyable? Did Melissa Meshey do a good job differentiating all the characters? How? Not particularly. It was difficult to determine who was talking during dialogue scenes. Although I did like the pleasant and youthful sound of her voice, I found her reading style to be sleepy and disengaged at times, making it hard to follow the story. I was provided a free audio copy in exchange for an honest review. The scones didn't do it! I want to visit Danger Cove! Any of the books stand alone very easily, but reading more of them adds layers. The emphasis in this one is the bakery, the new owner, Riley, with her vintage clothes, there are recipes, and, of course, a totally unexpected murder and the investigation. Lots of twists and a few red herrings, and an assortment of romances make this one interesting read. Melissa Meshey is perfect as narrator here. She has the perky bouncy persona just right! Turns out that I had an ebook copy hiding in my TBR pile, but won an audio! This book was pretty good. i enjoyed the story line and the characters. This was my first book by these authors but i had no problem following the story even though it was book 3, Riley takes over the bakery after her grandmother decided to let Riley run it. On the reopening day a ton of people came in for free samples after receiving the emails. Problem is Riley never sent any emails. Then the town &quot;hermit&quot; came in to talk to Riley but she did not get to talk to him with all that was going on in the bakery, The next day she finds him in the bathroom dead. Later, the ME said he died of a peanut allergy. Problem is the bakery does not use peanut products. Also he had eaten scones. Riley and staff did not put out scones as samples. Where did they come from? Who put them out? I was surprised at who the murderer was. I look forward to reading/listening more in this series. I received this book free in exchange for an honest opinion. The narrator did a great job too. This was an ok listen. The narration wasn't that great. There was little difference between the voices of the characters. There were also a few mispronounced words. The story had some odd skips too, there was one scene where the main character was in a house speaking to the nephew of a dead man and in the next sentence she was in a car with her best friend putting on a wig. The book just wasn't for me and that may have contributed to finding flaws where others wouldn't. The narrator of the audio is terrible, I literally could not even finish listening to the first paragraph. She sounds like a snotty 14 year old "Valley Girl". I have read all of the Danger Cove books and enjoyed them. In this light mystery novel reminiscent of some of Evanovich's stories, you are transported in a world of &quot;sweet&quot; accidents with an undertone of tragedy. 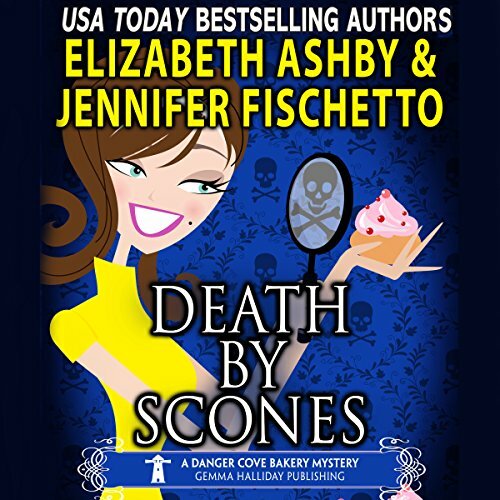 Well-written and interpreted, &quot;Death by Scone&quot; is a light read that will leave you with a smile and a desire for something sweetly decadent to eat. And why not try one of the scrumptious recipes interspersed throughout the story? I have not tried them...yet, but they sound truly delicious. I will definitely look for the other stories in this series. Truly enjoyed the book.